Crab Classic is a blend of wild caught, MSC-certified Alaska Pollock and real King Crab Meat. The Flake style product adds the mild flavor of crab to cold salads, sandwiches, dips and spreads. It can also be used as a flavorful and colorful ingredient in warm dishes, such as quiches, casseroles and chowders. Fat free and low in cholesterol, Crab Classic is also certified by the American Heart Association and is a source of Omega-3, providing 100mg per 3 oz. serving. 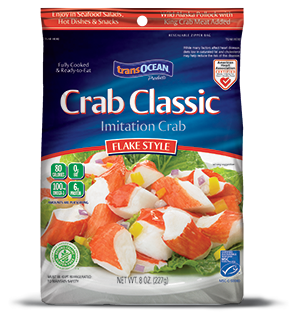 Fully cooked and ready-to-eat, Crab Classic makes it easy to enjoy delicious healthy seafood at any time.